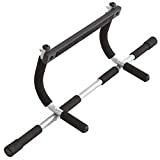 Transform Your Doorway Into A Gym – Door Gym Is The Multi-Function Exercise Bar You Can Use To Do Pull-Ups, Chin-Ups, Sit-Ups, Dips, Arm And Shoulder Exercises. The Perfect Bar To Complete An Array Of Upper Body Exercises. The Door Gym Uses Your Own Body’s Resistance To Deliver Great Results Fast. It Strengthens To And Tones Your Biceps, Triceps, Chest Back, Shoulders And Abs. It Instantly Attaches Top Or Removes From Your Door Frame With No Drilling Or Tools Required, And The Heavy Duty Steel Construction Supports Up 300 Lbs / 130 kg!